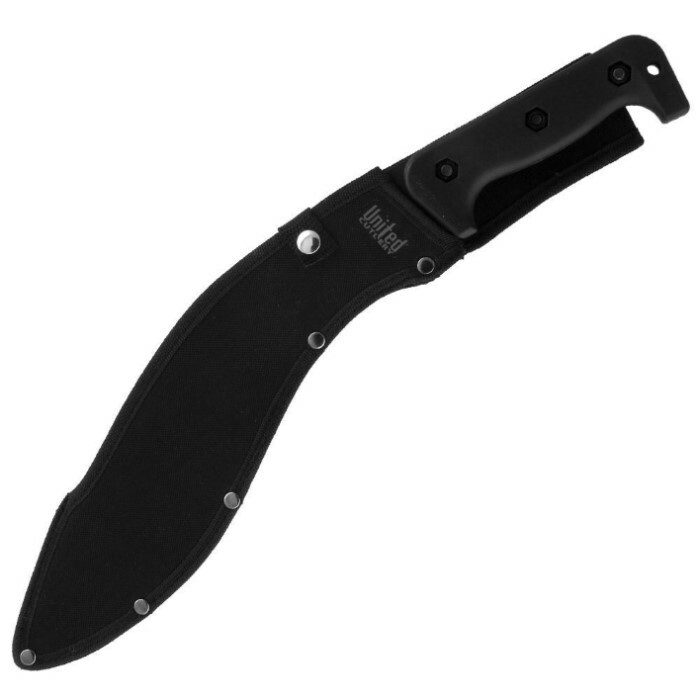 This high-impact resistant, tactical combat knife is designed to withstand extreme conditions. The solid full tang blade is constructed from black anodized stainless steel with a razor sharp edge. The impact resistant handle is heavy Kraton construction with thick heavy duty gripping power. Includes a heavy-duty reinforced ABS sheath with nylon belt loop. 12 1/2" blade. 17" overall. This Thing Is Everything A Kukri Should Be, Its Not Excessively Front End Heavy, Sharp As Hell, Feels Nice In The Hand, A Little Thick At First But you Get Used To It, This Thing Cut Through The Box It Came In Like It Wasnt even There, Its Awesome, If Youre Looking For A Kukri Thats Not Over Ridiculously Forward Curved And Still Resembles A Ghurka Kukri, And Is Full tang 100%, This Is It. I like this knife. 5mm thick full tang stainless steel. It came sharp, and a few pulls across my knife sharpener made it razor sharp. It's nicely balanced, and the handle feels good, but a little smooth for my taste. I wrapped hockey tape around it. The sheath is suitable for storage, but probably not carry. I'm going to buy another. Read the reviews and it's all true! Sharp out of the box. Comfortable handle to match my Beckers once tennis grip wrap is applied. Sheath is adequate but would benefit from a retention strap around the handle IMO. All in all an excellent buy. You would be hard-pressed to find a better Kukri for this price point. This is the most amazing blade I've ever owned. It comes sharp and stays sharp, no matter how much you swing it. Even if you do dull it a little, it is easy to maintain, and is sharp in seconds. The sheath is kind of crappy, but it's not too bad. The grip takes a little getting used to, but I'd still recommend this machete to anyone who wants pure power in their hands. Nice heavy sturdy kukri knife. It came sharp out of the box. I tightened the handle a bit, no problem. It comes with allen head bolts that go through the handle and blade and is attached on the other side of the handle with nuts. I tightened it up and then put some superglue on the nuts so it wouldn't loosen up. Thick blade, and a nice "feel" to the handle. All in all a great kukri!! wow i bought this knife and straight out of the box it was sharper that a razor blade, i have been cutting down trees with it for 2 weeks and it won't go dull. actually its so sharp i cut through a branch and ended up hitting my leg with it, and its still as sharp as a razor. 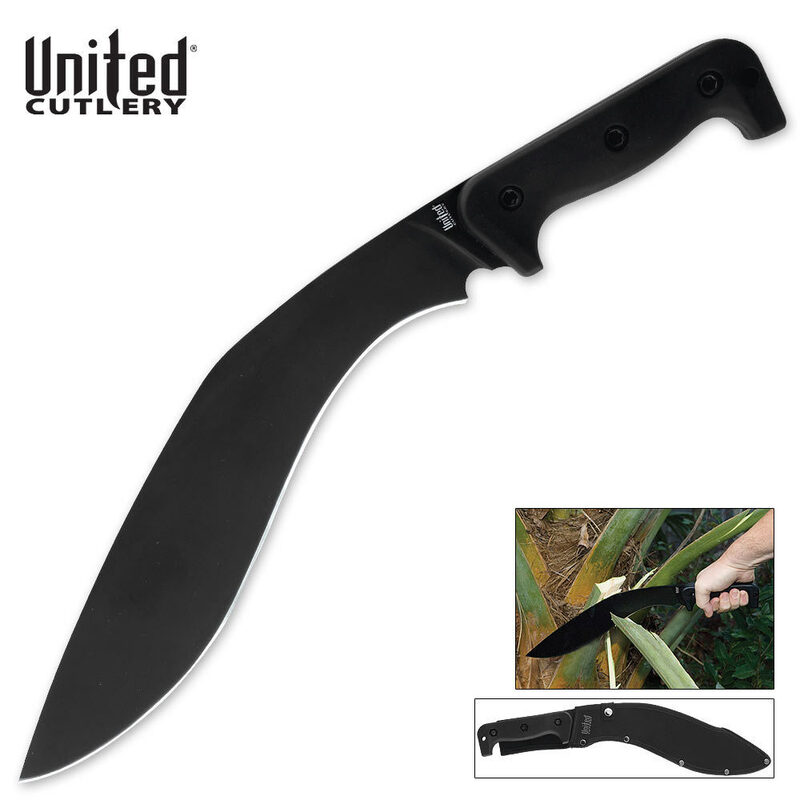 if your looking for a good machete or kukri this one is great! Wow, I'm not sure if I agree with LEVI who called this "machete" a "common mans Cold Steel"... then again I don't disagree either. I'll have to think on that a long time. I collect blades and the bulk of my collection is CS, I've always looked on United products as 'the best of the bad'-- cheap but serviceable --- but with the introduction of United black and M48 the whole United line has jumped way up in quality, up to the point that whenever I buy an edged weapon in the future, I'm going to do serious research before I just jump at the Cold Steel, Ka-Bar, (American made) SOG or Ontario. This is a fine knife, good enough to take into any situation that my life depends on without worry. True, the sheath isn't as good as the sheaths that accompany any of the brands mentioned above, but I took care of that with 2 pieces of leather scrap (to cover the outside tip end of the sheath) and 2 strips of velcro to keep the blade from climbing out of the sheath, but that's about it, I gave it a few swipes on a good ceramic rod and stropped it - it shaved hair out of the box and it still shaves hair, the Kraton handle is a huge plus, although I didn't like the wide flat grip till I wrapped it with tennis handle wrap, then it became a beautiful control surface. It's heavy, well-balanced, sharp, has great edge retention and is as well made as any of the issue WWI kukris I own and the dog-leg and belly angles are identical. This is a fine knife and I will add United to the list I mentioned earlier in this review. By the way, LEVI's review is the reason I decided to try this knife out before sinking another 100 bucks into another Ka-bar Heavy Bowie (my last one was stolen), so folks *please* continue to write, thoughtful accurate reviews - the power of this type of instant person-to person communication cannot be underestimated, and it gave me one heckuva pleasant surprise, thanks very much to all. I hope my past and future reviews provide information as useful as these 3 gave me. Just add some black tennis handle wrap and you have an amazing cutting tool that is well made and sharp enough out of the box to be intimidating ........buy it!! !